Sad news. Saturday, a territorial fight took place at the MCC. Max (b/g 5/*E) was recovered down on the ground. He is at a rehab place now with a bad eye wound and also a wound to his side. I saw two peregrines very active in the MCC airspace all day Sunday and witnessed two copulations. Hopefully, Max will recover and the new pair will be successful this year. Edit: I kept this post short the first time around, but I feel like I really need to say something. I’ve spent too many hours to count watching this particular peregrine over many years. The MCC territory was the first one assigned to me by Mary and Matt. Max and his mate Hercules were massive, majestic and utterly breath-taking. I’m a biologist. I record what I see, get the data that we need and go on to the next site. But, I’d be lying if I said that this site and this pair didn’t hold a special place for me. So, I wanted to pay due respect to Max. I really hope he heals and finds a place to live out the rest of his days. 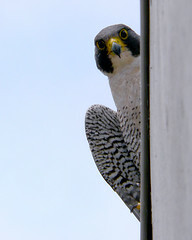 Honestly, he’s one of the most expressive peregrines I’ve seen — the picture above I offer as evidence. Anyway, ’nuff said. Just wanted to give him some respect. ~ by Steph on March 18, 2013.